Nnedi Okorafor is one of my favorite science fiction authors. She’s brought to life a dystopian Sudan filled to the brim with magic and chaos in her novel Who Fears Death (which was recently optioned by HBO to become a new show) and brought awareness and diversity to the difficult subject of PTSD in her Binti Trilogy. 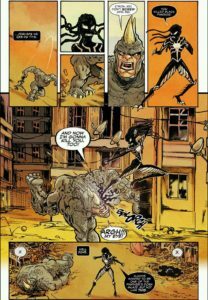 So, it’s actually really hard for me to say this, but Nnedi Okorafor’s story Blessing in Disguise in Marvel’s Venomverse: War Stories #1 is ableist. I’ve seen the praise for this comic all over Facebook, Twitter, and Instagram. It even sold out in the comic shop that I own. Of course, I was excited. 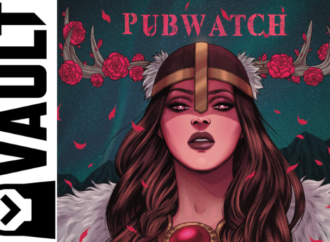 Marvel rarely hires black women to work on their books, and Okorafor is an author I love. But after reading the first few pages of the story, I had to put it down, and it took me days to pick it back up. I’ve seen countless articles of praise and adoration for this story. It got to the point that I was worried that if I spoke up I would fall into the narrative of “black women tearing down other black women,” and I would never want to be party to that. But the posts keep coming and no one has mentioned the glaring problem I saw from the moment I read those first pages. Nnedi Okorafor is an author who champions diversity and visibly within fiction, which makes this realization even harder to swallow, and the sites that are praising the book seem to be the same. No one is talking about the elephant in the room. 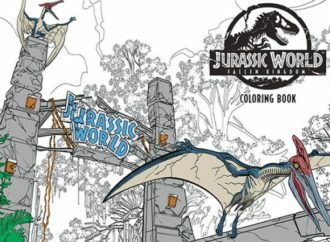 So, I sent a rough draft of this article to a friend (who is a comics creator and friend of Okorafor’s) to look it over and give me his thoughts. It was then that he put me in contact with Nnedi Okorafor herself to discuss the ableist themes I found disheartening in her book. We talked via email about how this story is one that is close to her own challenges with a disability. To quote her, “I put a lot of myself in this girl.” I felt that to fully understand what she went through, it would be better to read it in her own words. Though she saw the importance of the conversation, “It was eight pages, but I put a lot into that story about disabilities, and I don’t think I was being ableist. I have been waiting for someone to ask me questions about disabilities in this story and no one has. I find that very troublesome. So thank you for giving me the chance to say all this because it was a BIG part of the story.” I feel like when the topic of ableism came up Dr. Okorafor went on the defensive, clearly not understanding how her story could be offensive to her disabled fans. 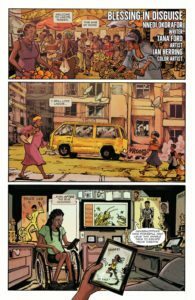 I agree with her that there was no way to fit a lot of backstory in an eight-page space, but so much of Ngozi is the backstory not seen in the comic. And a lot of it is based on Okorafor’s personal history. For those who have no point of reference on those subjects, it makes it difficult to get the full scope of the story Dr. Okorafor is trying to tell. As a disabled black woman, I was conflicted to bring this up. Nnedi Okorafor is only the fourth black woman to write for Marvel in their 78-year history. And all of those have been within the past two years. Aside from that, Nnedi Okorafor’s inspiration for the story comes from the real-life story of the Chibok girls of Nigeria. On the night of April 14, 2014, 276 girls were kidnapped from their secondary school in the town of Chibok, in Borno State in Nigeria, by the terrorist group Boko Haram. That night, 57 girls broke free; 219 girls remained in captivity. To this day only 106 girls have been freed. This is obviously a story that needs to be brought to light, and I want to be happy that a black woman is getting a chance to tell it. And that she’s created a story many love. But as a person who asks for diversity and strives to provide that, Dr. Okorafor failed to take into account the black disabled people who would read this book and be wounded. This fits into the inherently ableist idea that being disabled means you have a lower quality of life. The problems begin with the title of the book, Blessing in Disguise. Spoiler Alert: The blessing is that the main character’s disability is cured. Yep. Seriously. The book begins in Lagos, where we join a young black girl named Ngozi who’s sitting in a wheelchair looking longingly at pictures of her able-bodied past. Now obviously becoming disabled is a huge life change for anyone, but it’s important to notice that mainstream stories are often about able-bodied people who become disabled, which frames the change as a loss. This fits into the inherently ableist idea that being disabled means you have a lower quality of life. Also, in the panel is a television showing a nature documentary about grasshoppers. The TV begins to say, “Grasshoppers have powerful hind legs that enable them to escape from threats.” There’s something innately awful about the idea of a disabled person wishing to be more like a grasshopper. It dehumanizes Ngozi to the point where she’s less than an actual insect. Obviously, these are not malicious decisions by Okorafor, this is just how insidious ableism is in our everyday culture, that able-bodied people imagine disabled people would be haunted by the fact an insect can use the legs they no longer have control of. We have to ask why these stories always have to be centered around the tragedy of the able-bodied becoming disabled. All the while, Ngozi is sitting in her wheelchair holding a photo of herself before her accident. She’s running across a finish line. All of her trophies from her track days surround her in the background. Her walls are plastered with posters of Bruce Lee and of the Dora Milaje. There’s nothing wrong with an exploration of disability and unhappiness. Often, it’s hard to exist as a disabled person; the world is inaccessible and society is built on the backs of our oppression. But when thinking critically about storytelling and narratives, we have to ask why these stories always have to be centered around the tragedy of the able-bodied becoming disabled. The exposition-foreshadowing television goes on to say, “Because their legs are so powerful many forget that they can fly…” Ngozi then sees a grasshopper and makes her way outside to catch it. As she’s marveling at the creature in its jar, she finds herself in the middle of a superhero battle. During this fight, T’Challa drops a vial and it rolls next to her wheelchair containing the symbiote, which breaks free and begins to crawl up her chair, taking over her body. “Venomizing” her, the symbiote begins to talk to her and finds out her name is Ngozi, which means “blessings.” Then Ngozi stands, shocked to find that she can now walk. Ngozi sits in her room reflecting on her past. SMDH. 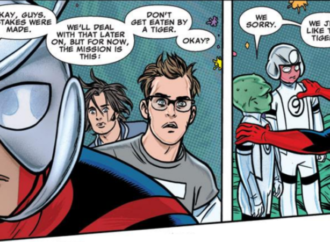 This plays into so many horrifically dangerous tropes, it’s hard to fathom that no one at Marvel had the wherewithal to maybe show this to a disabled person or think that “curing” a disabled person was a messed up storyline. Anyway, Okorafor’s already playing on the overused trope that wheelchair users long to be outside and that the chair is holding her back. The most important fact here is that being in a wheelchair doesn’t make the world a place you can’t navigate. Society does. Society is inaccessible and creates housing, transport, and structures that make it hard to find freedom when you’re a disabled person. Being disabled and in a wheelchair doesn’t stop you from doing things. Ableism does. And framing a wheelchair as some kind of prison is wildly problematic. So now we reach the “blessing.” The blessing obviously being her gaining the ability to walk again, and because she’s now an able-bodied person so now she’s able to live to her full potential. Something she couldn’t do before in her wheelchair. As a black disabled woman, this is unfeasibly offensive and depressing. 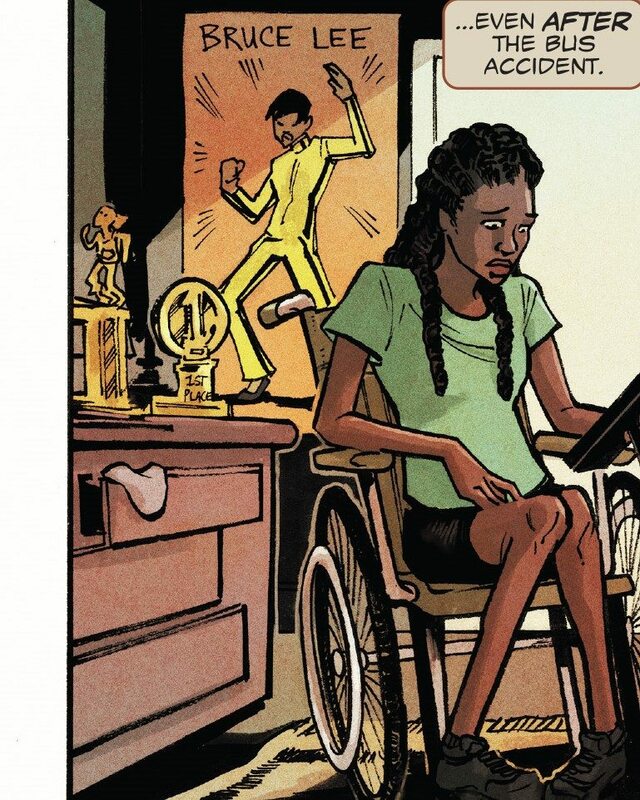 This should be a story I revel in–it’s so rare that as a black wheelchair user I see myself in comics. But the message from this comic is that I should hope a psychopathic alien attaches itself to me so I can be “fixed”?!? Wouldn’t it have been more radical to allow a young strong-willed black girl in a wheelchair to become the protector of Wakanda? The final pages paint her family as relieved that she’s been attached to the symbiote, stating that, “She’s strong, but without the symbiote, she’ll never walk again.” Ngozi’s family would rather have a homicidal alien attached to their little girl instead of her being in a wheelchair. Not only that, but she then goes on to become Black Panther. Wouldn’t it have been more radical to allow a young strong-willed black girl in a wheelchair to become the protector of Wakanda, rather than a newly able-bodied girl powered by an alien, which canonically in the comics and the 2007 film Spider-Man 3 has turned everyone who wears it into a murderous criminal? But I suppose in this case it’s better to have that risk than not be able to walk. Blessing in Disguise plays on the common fear abled people have of becoming disabled and then leading an unfulfilled and mundane life. With her track career over, it’s obvious that Ngozi longs for the past. 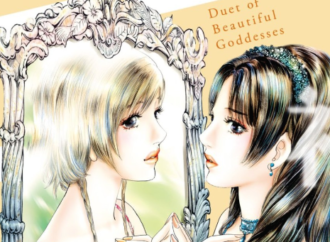 The artist Tana Ford clearly depicts this longing within the first couple of pages. Ngozi’s are walls covered in her idols, Bruce Lee and the strong female warriors who guard the Wakandan royal family, the Dora Milaje, both of which are known masters of their bodies, skilled able-bodied fighters. Her room is a strong juxtaposition of what she’ll never be able to achieve because of her disability. She is surrounded by her limitations. 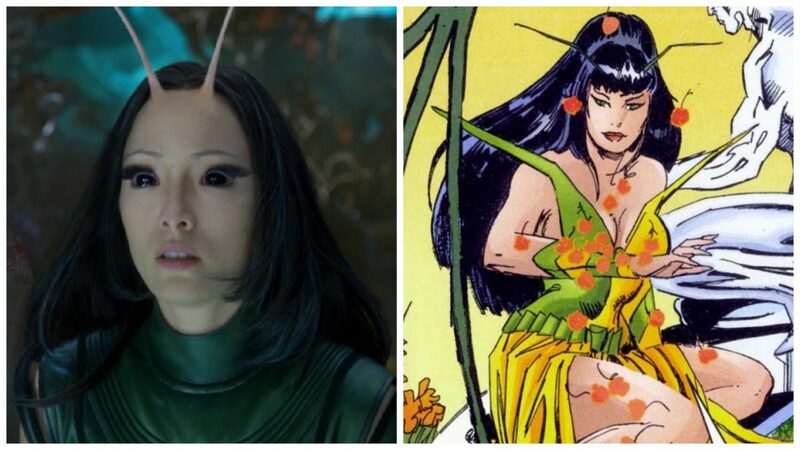 It’s only when she breaks free of that “cage” and goes to get her “strong-legged” grasshopper that she is freed from the curse of being disabled by Venom. Tana Ford’s art and Ian Herring’s colors enforce the ableism within this story. 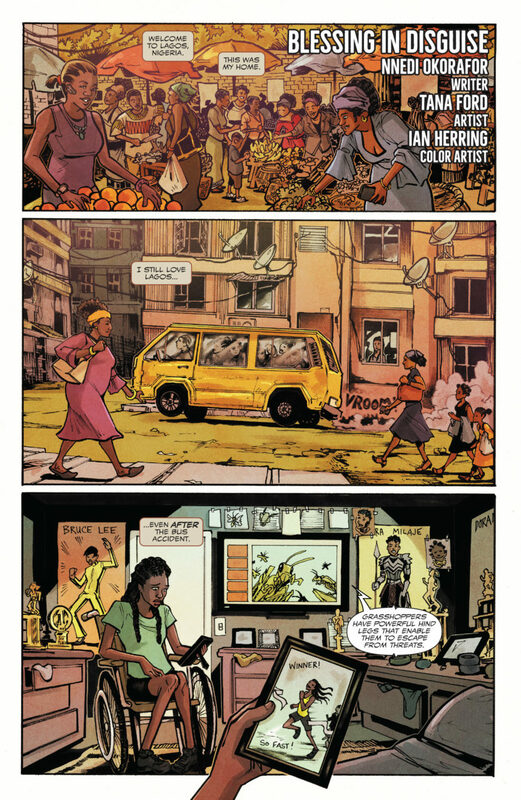 In the beginning of the story, Lagos is a vibrant city with splashes of gorgeous color. But when we get to Ngozi’s room it’s a desaturated space. The walls are a dull pale green, and the only hints of bright color reflect in her trophies and pictures of her colorful past. Tana Ford draws Ngozi small in her chair. Her head down and sorrowful. Whenever Ngozi is in her chair, Herring colors make it seem like the life has been sucked out of her, and she becomes an ashen ghost of able-bodied past. The moment she is paired with Venom, Herring adds color to her surroundings. Her palette becomes more dynamic, with the yellows and oranges of Lagos highlighting the stark black of her symbiote suit. The first time we see Ngozi truly happy is when she see’s her grasshopper, a representation of strong legs. Ford draws her manically happy as she races out to catch it. She only smiles again when she is standing outside of her wheelchair, having become that strong-legged grasshopper. Her legs physically taking on the bugs shape. 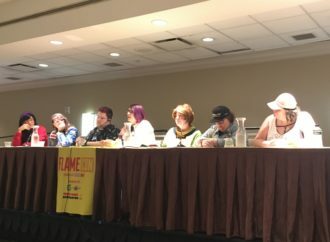 In the panel of her standing for the first time, there is a bright light framing her, her wheelchair appearing smaller as she is standing tall in front of it. 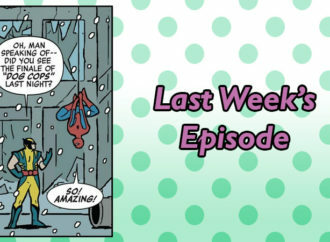 Ford and Herring create this awe moment almost like the symbiote was the miracle Ngozi was waiting for. Tana Ford drawings and Ian Herring’s colors emphasize and hone in on the ableism of this story making it more vivid and apparent. Ngozi could still compete in track competitions, she could still do marathons, and win medals. These are all sports that disabled people regularly compete in. This is a story so clearly written and drawn by able-bodied people who can’t seem to fathom the fact that being disabled isn’t a death sentence. Being in a wheelchair doesn’t stop you from being an athlete. And it definitely doesn’t stop you from being happy. Thousands of disabled people compete in sports every day and buck against the helpless, depressive stereotype portrayed in Blessing in Disguise. This story completely broke my heart. 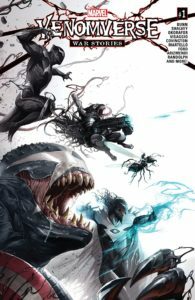 As a wheelchair user and a fan of the author, I just couldn’t get past the subtext throughout the story that she’s now “better” and that her life before the symbiote was inferior. I believe this story could’ve been told in a way that didn’t belittle those of us who live with disabilities every day. The tone in which disability is handled in this story isn’t something new. With all forms of media playing into ableist stereotypes, it’s easy to see how this topic often goes overlooked. With films like Me Without You, Everything Everything, and A Walk to Remember, and the ableist nature of the comics industry at large, it goes without saying that we have a long way to go on the visibility of disabled people and the toxic stereotypes they’re usually relegated too. 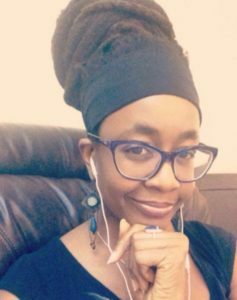 It was recently announced that Nnedi Okoarafor will be writing two arcs of Marvel’s Black Panther and that she will also bring Ngozi back in a future one-shot. I’m still a huge fan of Nnedi, and I hope by writing this piece more creators will seriously think about using disabled characters as a warning and/or inspiration stories for able-bodied people.